Since I am going on a swarm and plan to go regularly on a crop with my sweet friend Michelle, I went on her saying first to Tuesday Morning (what's with me and Tuesday's nowadays. I was born on a Wednesday. Should have named the blog Wednesday wonders - ha ha. ) Anyway found some very nice deals there would you believe. Cropperstation which are usually about $35 - for just 9.99 or 14.99. and blings and chipboards and stickers just packeted together. Some really nice KY memories and american craft papers for 3:99 - oh yes. Then on the way back I came to Home Depot to grab some handy dry wall tape -thanks to Sassy. (BTW a deviation - if you are using as magic mesh then remove almost immediately - do not let it sit on it for too long as it will permanently cure or that's what the guy said). I decided to also look in the tool box or storage section and here's what I found for $29.97. This can store easily about 60 or more cartridges with the books and keypad overlay's. It opens with a cantilever type and it even has some support at the back so that the box does not tpple over. It's Husky 22" cantilever box. There are 2 varieties almost similar but I decided on this one as it looked more compact and the inside even though shorter in height was more wider. There are 12 storage bins inside and I removed almost all and left just 3 inside. I will use this to store some embellishments. Btw there was one more red colored one which was just $9 which would also have done the job but I liked this one better as it looks stackable and opens up with support instead of toppling. OK without much ado here are the pictures. Look how my 2 cuties posed for the picture. Great storage idea. Thanks for sharing....and those two pups are just adorable. 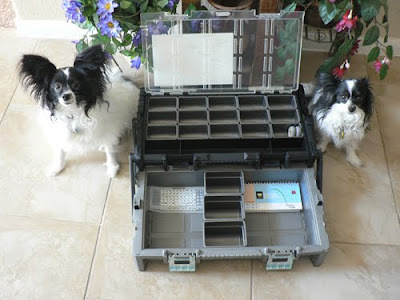 Just stopping in to say Hi,from Tammy(Creative Critter)Blog.Love that storage box.Oh!! 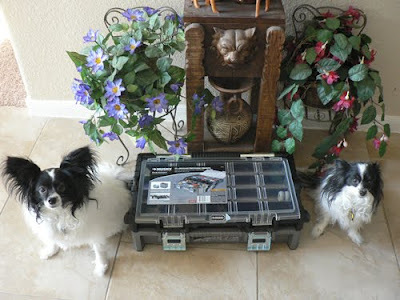 !Tammy say Hi to.Love your puppies(Two Precious Gems). Great find Pam. I may have to stop over to HD tomorrow and see what I can find! Thanks so much for sharing. And I love loev love your 2 sweeties posing on the pictures :) How cute! !